In a large bowl, whisk together the eggs, mayo, mustard, Worcestershire, and salt until smooth. Stir in the peppers and chives. Gently stir in the crab meat (try not to break up all the nice meaty chunks!) and then stir in 1 cup of the bread crumbs. The mixture should be fairly wet, but you should be able to form a crab cake. Form into about 16-18 medium-sized cakes. Put the cakes on a plate or platter, cover with plastic wrap and refrigerate until ready to fry; the cakes can be made up to 3 hours in advance. Heat the oil in a large saute pan over medium-high heat. 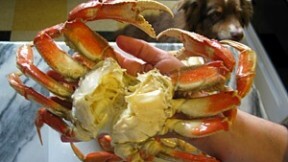 Put the remaining cup of bread crumbs onto a plate and lightly coat each side of each crab cake. Place about half of the cakes into the hot pan. You should be able to fry the crab cakes in two batches. Transfer to a paper-towel lined plate to drain, then fry the other half. Serve at once with plenty of Meyer lemons.